Oxfam UMD members and Hunger Banquet participants get together for a picture. Colleen Crowley/Mitzpeh. For many students at this university, Thanksgiving involved abundant feasts and showing thanks for their good fortune this year. 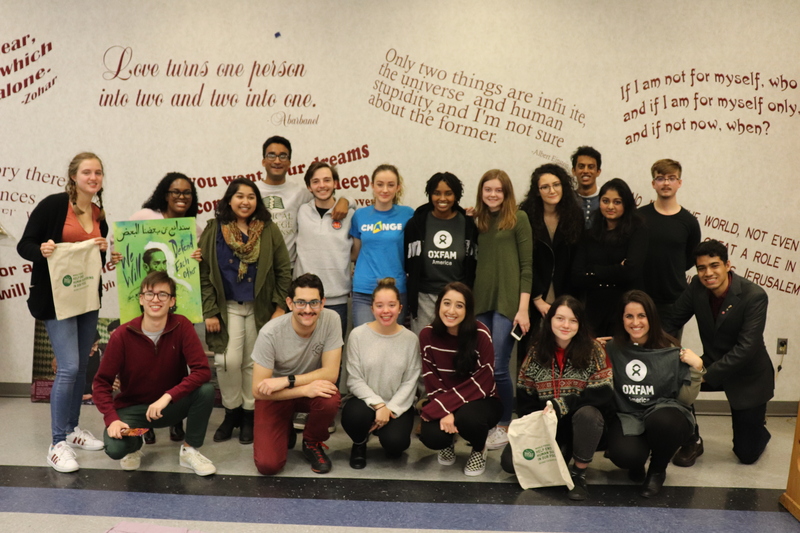 Just days after the holiday, Oxfam America at the University of Maryland showed their fellow students just how fortunate they truly are. 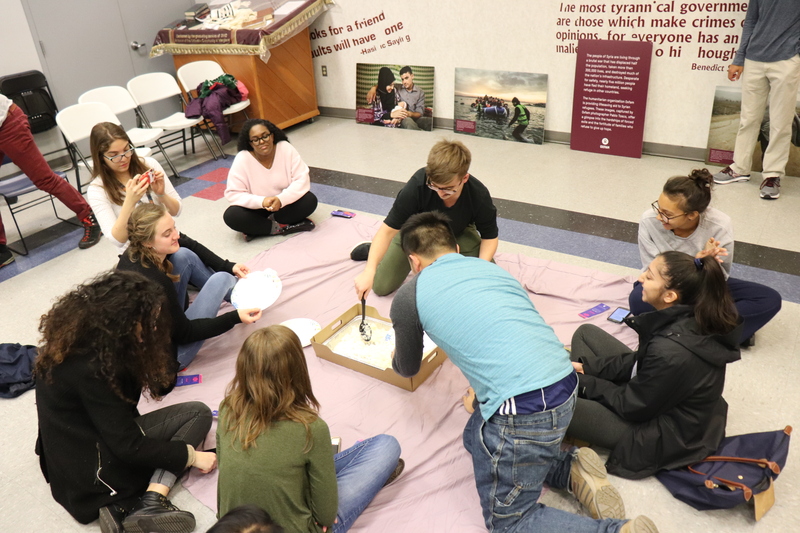 Oxfam UMD’s Third Annual Hunger Banquet, held at Maryland Hillel, grappled with issues surrounding food insecurity, distribution inequality and the global division of the classes. “We have facts that show there’s enough food to feed the whole world, and yet we have the highest level of hunger that we’ve ever had,” said Oxfam UMD co-President Danie Stewart, a sophomore government and politics and Spanish major. She, along with her co-president and representatives from other student organizations, ran the Hunger Banquet simulation. Upon arrival, attendees were separated into “high income,” “middle income” and “low income” groups that reflected global percentages. They were then seated at a table, in chairs and on the floor according to their respective income levels. During the simulation, students were classified as “low Income” and ate a meal of rice on the floor. Colleen Crowley/Mitzpeh. When food was served, “high income” individuals received balanced, nutritious meals and “middle income” participants had a simpler meal of rice and beans. “Low income” individuals ate plain rice with their bare hands. 80 percent of the world’s population, Stewart said, is categorized as “low income,” meaning they survive on about $2,000 per year or less. Additionally, “The threshold for ‘high income’ is $7,756 a year,” said Stewart. However, food insecurity does not discriminate and can even affect students on this campus. 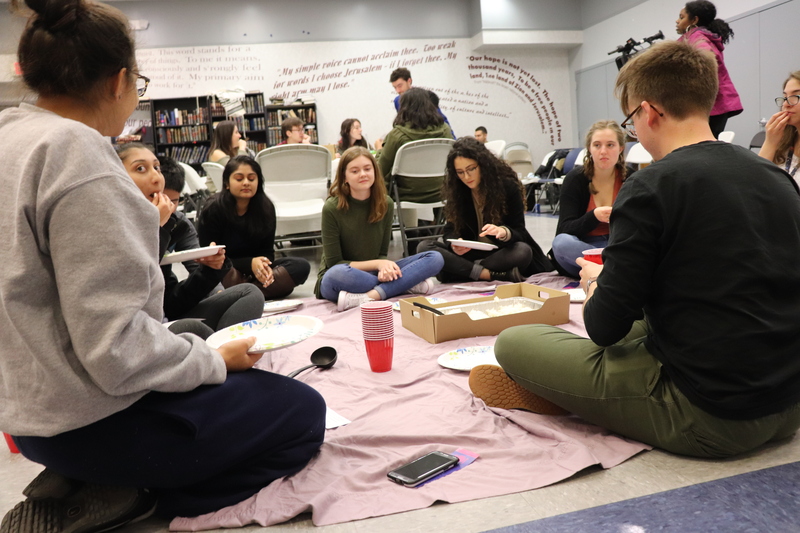 “We wanted to angle this year’s Hunger Banquet around global issues, but also issues right here at home,” said Stewart. According to a report from The Diamondback earlier this year, nearly 20 percent of students at this university face food insecurity. Students discussed the impact of the simulation over their dinner of rice and water. Colleen Crowley/Mitzpeh. In addition to the food insecurity simulation, Oxfam UMD partnered with student representatives from Student Government Association, Residence Hall Association, National Residence Hall Honors Society, Campus Pantry and Safe Center, who shared ways for individuals to get involved and fight food insecurity in the local community. The Campus Pantry, located on the bottom floor of the University Health Center, aims to provide food insecure students, faculty and staff with nutritious emergency food supplies. Safe Center, which serves human trafficking survivors with a myriad of legal, medical, and economic services, provides food items to clients who may not be able to afford food. Both organizations have opportunities for students to get involved through volunteering, running a donation drive or simply donating food items. No Replies to "Food insecurity gets real at Oxfam UMD Hunger Banquet"